Retractable Banners is rated 4.7 out of 5 by 188. Rated 5 out of 5 by Ilovecouture from Great buy Great high end product for mid range price point ! Rated 5 out of 5 by kevin.x from Great banner, great value Ordered it for a conference and received it on time. They sent the proof before print and identified some problems of my design, even though I did not check the option. Rated 5 out of 5 by prez from Great Banner..Arrived on Time! Couldn't be happier. Really appreciated having access to wealth of pictures available in the library! Retractable banner printing is a must-have for any convention, political campaign, trade show, or display. 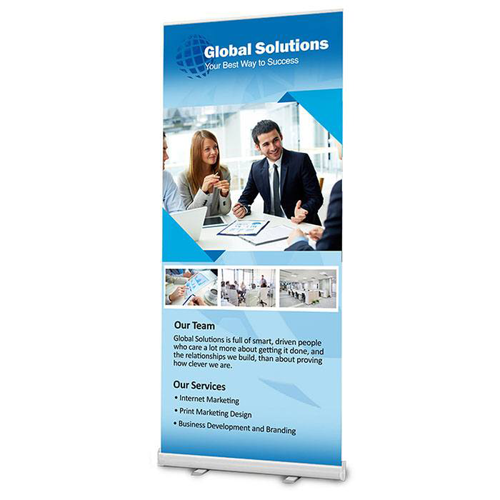 Retractable banners, or pull-up banners, retract in one smooth motion, allowing for compact storage and quick setup during indoor events. Your retractable banner design is printed on 13 oz. poly film, a durable, curl-resistant, and waterproof material. The smooth, white surface showcases the design. It has a high opacity that prevents the front from bleeding or showing on the light blocking gray back. We only print on one side so that the sturdy aluminum stand can be setup at the back. Choose from three standard sizes that will suit both vertically or horizontally oriented designs. 23.5” x 79” is our longest and thinnest design. Recommended for banners meant to be read from top to bottom. 33.5” x 79” is the most popular size among customers, as it provides ample width and a standout height. Ideal for a retractable pop-up banner with a large image and focused blocks of text. 47” x 79” is our widest size available, making it suitable for designs with text or visuals best read from left to right. It’s also recommended for retractable banners that have several images and other visual elements. 1. Place the base on the ground. Rotate its feet by 30 degrees. 2. Connect the poles then insert them in the slot found at the top area of the base. 3. Lift the header bar then pull th ebanner up from the base. Maske sure to pull it from an angle. You'll have a hard time pulling ti perpendicular to the ground. 4. Insert the top header bar inside the slot at the end of the pole. Does my order come with a replacement banner? No, we do not include replacement banners with the order. However, all retractable banner stands and accessories last a minimum of five years with the proper care and maintenance. Can I use the banner outdoors? Our retractable banners are recommended for indoor use. To ensure maximum protection during transport, all banners come with a travel bag. The 13 oz. poly film material is also waterproof and crease resistant in the event of other potentially damaging factors. How fast can you process my order? We can print your carbonless forms in as little as 48 hours. This 2-day period is referred to as the printing turnaround time, which does not include shipping transit time, weekends, and holidays. This time begins once you have paid for your order and approved the proof.